Hey! Welcome back to Part II of our series on “How to analyze your credit report.” Like I mentioned in Part I, having a solid credit score and good borrowing capability is almost as important as money itself. One recent example is my step son (‘Gus’), who just turned 18 and can’t get his own phone plan because he has no credit (full disclosure: we are trying to get Gus off our wireless plan since he uses a bizillion gigabytes of 4G data every month!). For his own plan, he (e.g. ‘we’) would need to pony up a ridiculous $750 deposit to make up for his lack of credit. Thus, it will really be nice when Gus establishes his own credit. Likewise, once you do have good credit, it’s important to guard and monitor that credit score so you can do, and have, the things you deserve (car, trips, vacation, etc). Good credit is really powerful. You don’t want to lose it. So, go ahead and read this article and learn more details of what your free credit report shows you and how to interpret the data. If you haven’t already, I highly suggest you read Part I first. Calculation of FICO score and weighting of factors. We ended that post by talking in detail about the two major components: (1) Outstanding Debt and (2) Payment History. Today we will finish up by talking about the other three components that make up your FICO score: (3) Length of Credit, (4) Shopping for New Credit and (5) Type of Credit Used. As my step-son Gus can tell you, the length of your credit is a critical factor in determining your credit score. Like Gus found out, if you don’t have a credit history, or its short-lived, you will have a hard time obtaining borrowing power. In an ideal world, you will have a 20-30 year history of impeccable credit over multiple credit lines and credit types. Believe it or not, closing old credit cards or credit accounts could actually hurt your FICO score! If you close an account, you are closing a chapter in your borrowing history. It may actually be better to pay down those credit cards but leave them open, just don’t use them! By having those credit card balances paid down shows that you can manage your credit and have the ability to pay down your balances and not lose control of your borrowing power. I am sure you get offers for new credit cards all the time. If not, at least you see all the offers at your local retail stores or even gas stations. Don’t do it! Each time you apply for a new credit card, a credit report is run against your Experian account. Also, if you apply for a lot of credit over a short period of time, that will hurt your credit score. On a good note, however, apparently multiple inquiries from auto or home mortgage lenders does not affect your FICO score so you may not have to worry about a car loan or home loan affecting your credit score. 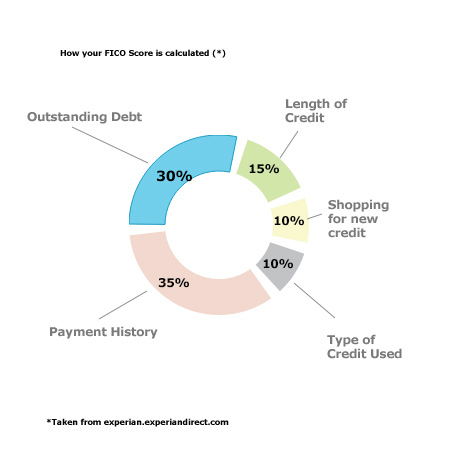 The final factor in calculating your FICO score is the type of credit you use. In some weighted fashion, the credit rating agencies look at the ‘blend’ or mixture of your credit cards, retailer credit accounts, auto loans, installment loans and mortgage loans. Although this minor component normally won’t drastically affect your score, if you don’t have a long credit history, this factor may come into play. Stay tuned for the follow up article that does a final deep dive into your free credit report.